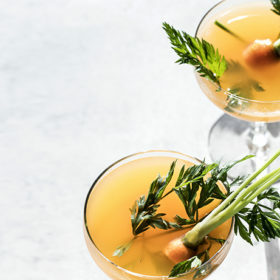 A vibrant color from a daikon radish simple syrup, when combined with lime juice, makes this color-changing gin gimlet a cocktail chameleon. Daikon radish, celebrated by some for its antioxidant properties, has another, highly unusual characteristic: it turns water a purplish-blue color. The hue is intensified when sugar and heat are added to make a daikon simple syrup. Then, lime juice is introduced to this drink to induce a shocking mood-ring effect, quickly morphing from blue to bright pink. In a cocktail shaker, combine gin and daikon simple syrup and fill with ice. Shake well, and strain into a chilled coupe glass. Slowly pour lime juice into the coupe, which will cause the bright blue cocktail to turn light pink. Infuse purple daikon radishes in ice water by soaking overnight, or up to 24 hours. The water will become very light purple. Strain and reserve the ice water. Measure ½ cup of the infused water, and discard any remaining water. Add ½ cup sugar into saucepan with the water, and stir until it dissolves. Remove from heat. Transfer into a airtight container and store in the refrigerator.